IRC is still the king for group chat in online communities, but it has a few problems when comparing to "modern" internet services. Historically, the most common solution to being connected and not miss messages is to have a CLI client (ircII, BitchXI, irssi, WeeChat) running on a computer always in a terminal multiplexer (screen, tmux) and then connect to that using SSH. Today there exists multiple different ways to get a more modern experience. While web frontends for IRC are not a new thing, historically they were not able to provide a good experience. But in my opinion, web clients are now able to compete with CLI apps in ways of bringing a powerful and usable chat experience. There are many products and services available bringing IRC experience to the web. I have put togheter a list of popular services (that I know of): http://irccloud.com, http://hipchat.com, http://grove.io, https://campfirenow.com/, https://github.com/kandanapp/kandan). While these services can be great for many users, the problems I have are that they are either non-free (as in freedom), too pricey or the wrong fit if you aren't an organization, and some provide IRC like functionality without being IRC, which means you are chatting in a silo, or have limited interopability / flexibility. The good things these services have going for them is things like ease of use, good cross platform support (Android, iOS, etc), good user interfaces, embedding content (images, videos), better visual experience, and more. So I have a quest to bring some of these features to IRC using free software. Another common way of being connected to IRC all the time is to use a bouncer (e.g. http://wiki.znc.in/ZNC) which also solves some of the same problems, but as bouncers commonly work using the IRC protocol itself, they struggle to achieve the same capabilities as WeeChat can provide using its own relay protocol. You can think of WeeChat + relay plugin as a super advanced and capable bouncer in addition to being a full client. 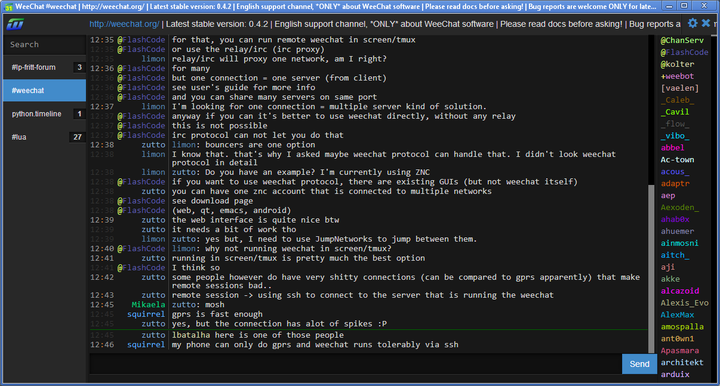 WeeChat is a fast, light and extensible CLI chat client. It runs on many platforms like Linux, Unix, BSD, GNU Hurd, Mac OS X and Windows. It can support multiple protocols, is modular, has support for plugin in many languages (C, Python, Perl, Ruby, Lua, Tcl and Scheme), free software (GPLv3), strong and active community. The biggest reason why we use WeeChat as backend client for a HTML5 frontend is that its relay plugin allows us to directly connect from the browser using Websockets. This means that the client does not need a special "backend service", as all that is provided by the IRC client itself. Glowing bear is a HTML5 web frontend for WeeChat that strives to be a modern and slick interface on top of WeeChat. It relies on WeeChat to do all the heavy lifting (connection, servers, history, etc) and then provides a few features on top of that, like content embedding (images, video) and desktop notification. It has also rudimentary support for running as a Firefox app or Chrome app, which means that it is really cross platform. It should run just as great on Android, IOS as on a desktop computer. This guide assumes you already have a server available where you can run WeeChat permanently. Start WeeChat in a screen to leave i permanently running. screen -S weechat weechat. Older versions of WeeChat uses the executable weechat-curses instead of weechat. Add a WeeChat relay that the web client will use /relay add weechat 40900 You can choose any port you want instead of 40900. Enable many colors to use for nick coloring /set weechat.color.chat_nick_colors "22,23,24,25,26,27,28,29,30,31,32,33,34,35,36,37,38,39,40,41,42,43,44,45,46,47,48,49,50,51,58,59,60,61,62,63,64,65,66,67,68,69,70,71,72,73,74,75,76,77,78,79,80,81,82,83,84,85,86,87,92,93,94,95,96,97,98,99,100,101,102,103,104,105,106,107,108,109,110,111,112,113,114,115,116,117,118,119,120,121,122,123,126,127,128,129,130,131,132,133,134,135,136,137,138,139,140,141,142,143,144,145,146,147,148,149,150,151,152,153,154,155,156,157,158,159,160,161,162,163,164,165,166,167,168,169,170,171,172,173,174,175,176,177,178,179,180,181,182,183,184,185,186,187,188,189,190,191,192,193,194,195,196,197,198,199,200,201"
Enter the port you selected in the relay setup. Enter the password you chose in the relay setup. Click the usage instructions to get some information about key bindings. If you can't connect, check with command /relay inside WeeChat to see incoming connection, if incoming connection is missing, check if firewalls are preventing access. 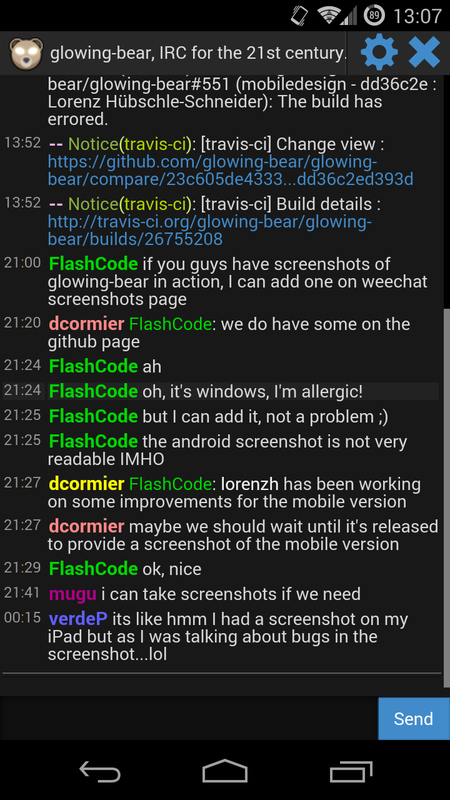 Please join #glowing-bear on Freenode if you want to chat with the developers of glowing bear. Please join #weechat on Freenode if you want to chat with the developers of WeeChat.